One small step for fish biologists, one great splash for bull trout! Sooo…this post is going to be about work. Which I rarely blog about, but last week was a good week, so I’m going to go ahead and share. One of the first projects I became involved with when I started my job here almost two years ago was the reintroduction of bull trout in the Clackamas basin, a little bit southeast of Portland. Bull trout once coexisted in the basin with a suite of native fish species including salmon and steelhead. However, bull trout disappeared from the basin in the 1960s (the last confirmed sighting was in 1963) largely as a result of overfishing and habitat degradation. So, now that many of the issues that caused bull trout to be extirpated have been addressed, the Fish and Wildlife Service, along with the Oregon Department of Fish and Wildlife and the Forest Service, decided that the time was ripe to reintroduce bull trout into the Clackamas to resume its spot in the ecosystem. Bull trout in the Kootenai River drainage in Montana. Photo by Joel Sartore, National Geographic Stock (used with permission). 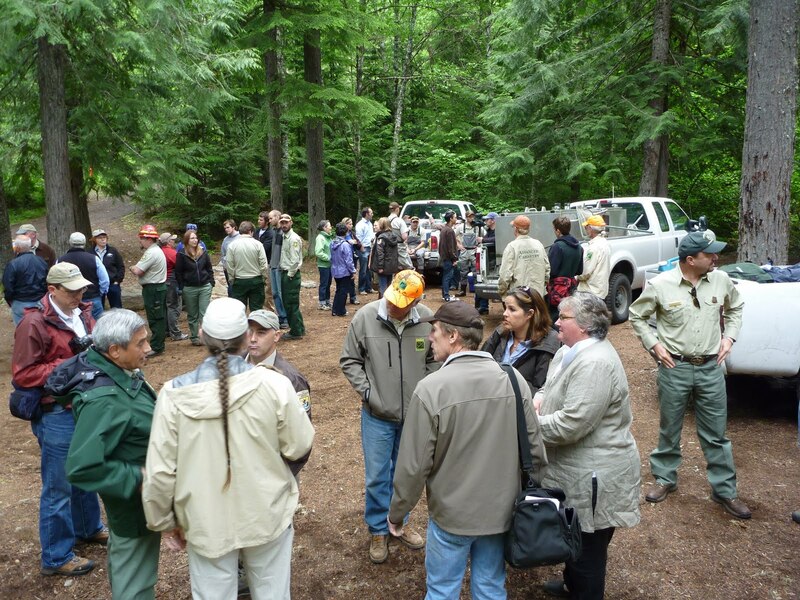 The reintroduction project has been in the planning phases since the mid-2000s. Bull trout were listed as threatened under the Endangered Species Act in 1999, and reintroducing them to a part of their native range falls under recovery actions planned for this species. Our office provides technical assistance to the regulatory folks, and it was my task to perform the preliminary bioenergetics modeling for bull trout, as well as lead the development of the Monitoring and Evaluation Plan for the project, which is anticipated to continue for up to 20 years (and perhaps beyond that). I am currently the chair of the M&E committee, comprised of biologists from several of the agencies involved in the project. It was a big task to complete the M&E plan, but a necessary one for a couple of reasons. First, the bull trout population in the Clackamas is an experimental one. The major benefit of having a strong Monitoring and Evaluation program is that we will learn something no matter what happens – we will learn why the reintroduction succeeded or failed. Either way, we will know more about what might work for the recovery of this population as this project progresses, and ultimately for this species elsewhere in its range. Second, we need to pay close attention to what these bull trout do in the Clackamas because there are other listed species in the basin, such as Chinook, coho and steelhead. In fact, this project has been fairly controversial because of concern for these other listed species, which makes it all the more important that we have a strong M&E program and dot all of our regulatory i’s and cross all of our regulatory t’s. 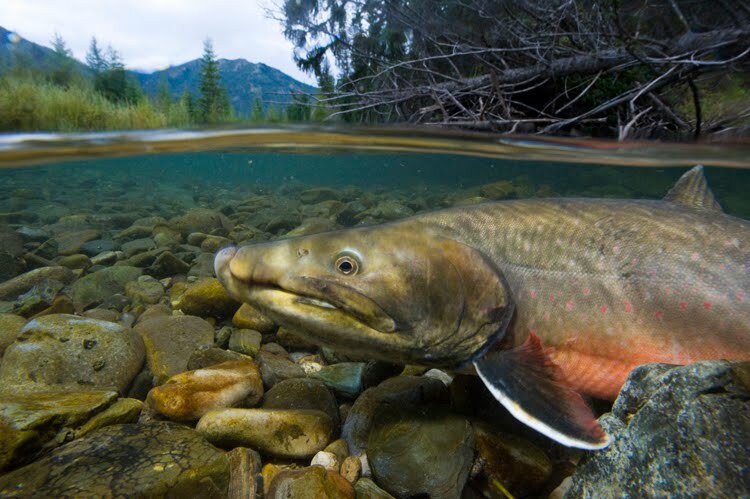 Because bull trout are top predators, where these species overlap in time and space salmon and steelhead may face an increased risk of being eaten by bull trout. Of course, bull trout eat plenty of things other than salmon and steelhead (other fish, insects, etc.). But part of our monitoring program focuses on the interaction of all of these listed species so that project managers can take action if it looks like the impacts from bull trout are greater than anticipated. Anyway, there’s a bit more to the story, but I’ll cut to the chase. Last week was a big week for us because we finally completed all of the regulatory requirements needed to get fish in the water. 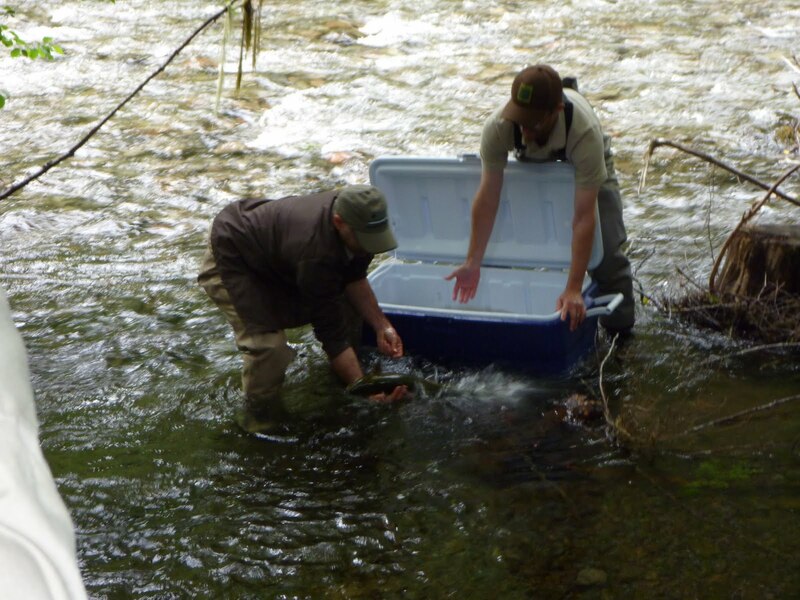 About 30 subadult and adult bull trout were collected from the Metolius, implanted with radio tags so we can keep track of their whereabouts, trucked over to the Clackamas, and released in the Big Bottom portion of the upper basin. Yay! There was a fair amount of press there, and it was great to see these beautiful fish swim in waters they hadn’t seen for 50 years. Let’s just hope they stay there! We’ll continue to move juvenils and subadults/adults through July, and our monitoring program will kick in almost immediately. And here are some pictures I took – enjoy! There were plenty of people on hand to witness the first bull trout release! Above, this bull trout was just taken off the transport truck. The cooler was walked down to the banks of the Clackamas and the bull trout swam in the waters of its new home a few moments later. 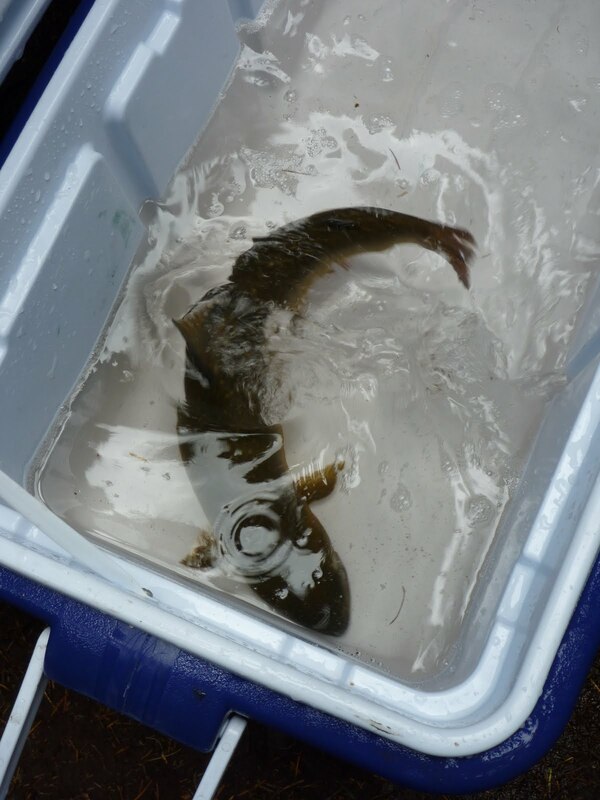 This was the first bull trout back in the Clackamas! Good luck – we’ll be keeping track of you! « Extreme Home Makeover – Booyah!